The website redesign continues! Next up is the ‘About Us’ section. I find it more difficult to do sometimes, because our users don’t use the About section nearly as much, so don’t always have much of an opinion about it. Although it goes against my usual inclination, I decided to go ahead with only minimal feedback. The old version of the ‘About Us’ is not the worst thing we’ve had on the site, but it could be a lot better. The worst part was really that ‘Locations and Hours’ had so much more than that, and having an ‘About Us’ section on the ‘About Us’ page seemed redundant and off. The order of the links in the sidebar once you were inside the About section also didn’t really reflect the landing pages either. Just to help me organize, I did a card sort by myself, and then got a couple of coworkers to look at it a bit further. We all struggled with how to label the administrative stuff, so I wrote down a couple of ideas and left it for the time being. I came up with only a single mockup, because there really wasn’t much to it. I’ve had this idea for a while, which is quite similar to the revised About that I did at a former job. Actually, I made two, but the only real difference is the coloured boxes, but the box design (which would match Research Help) felt rather forced. 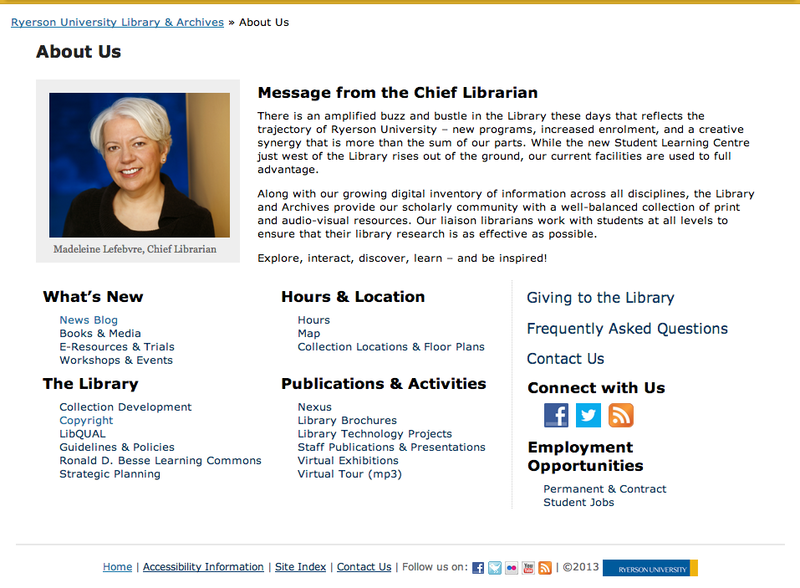 The picture and message from the chief librarian is something that the previous web librarian had wanted to include, and I thought it made a nice addition. I got a bit of feedback from the web committee, made a couple of minor changes, and posted and sent it off to the rest of the library. 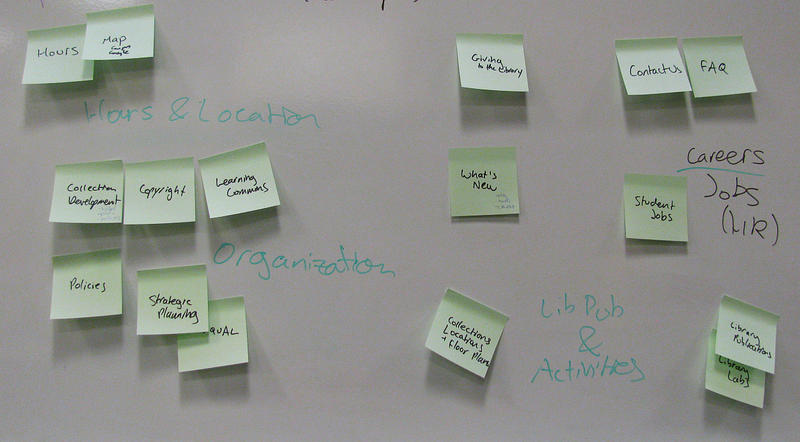 I then got some more feedback from various staff members through sticky notes and email. In revising About, there was actually little revision. Mostly, I reorganized the links so that hopefully the categories make more sense. I also wanted to separate out a few things, namely the header-sized links on the right. 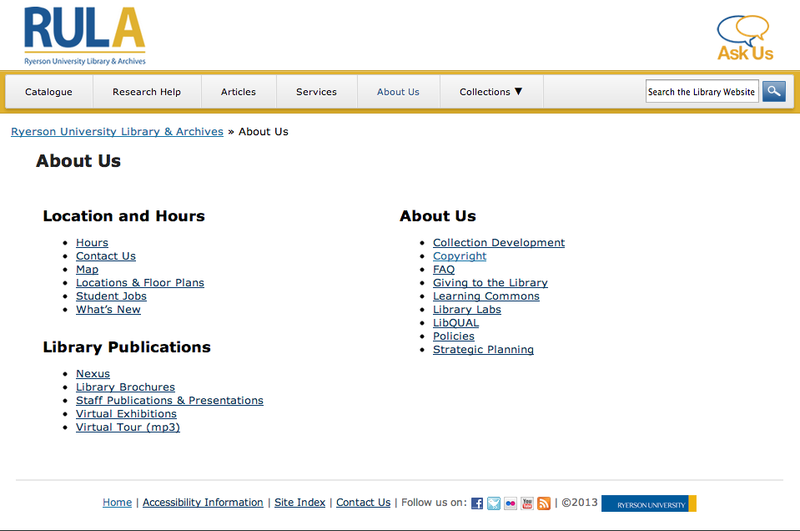 I reorganized many of the existing pages to reflect the changes to the About page, but the content stayed the same. The current version went live a couple of weeks ago, and staff at least seem to like it!